Official pre-season testing for the IMSA WeatherTech SportsCar Championship has completed at Daytona International Speedway. A pair of Porsche 911 RSRs fielded by the “works” Porsche GT Team and three Porsche 911 GT3 R customer cars ran six sessions over the course of three days in preparation for the Rolex 24 At Daytona later this month. The classic North American 24-hour race takes place January 27 – 28. The Roar Before the Rolex 24 brought 2015 Le Mans overall winner Nick Tandy (Great Britain) and two-time 24 Hours of Le Mans winner (2015, 2017) and reigning World Endurance Championship (WEC) LMP1 champion Earl Bamber (New Zealand) back to the GT Le Mans (GTLM) class of the North American championship in the Nos. 911 and 912, respectively. The two popular drivers spent 2017 campaigning the Porsche 919 Hybrid in international prototype competition. 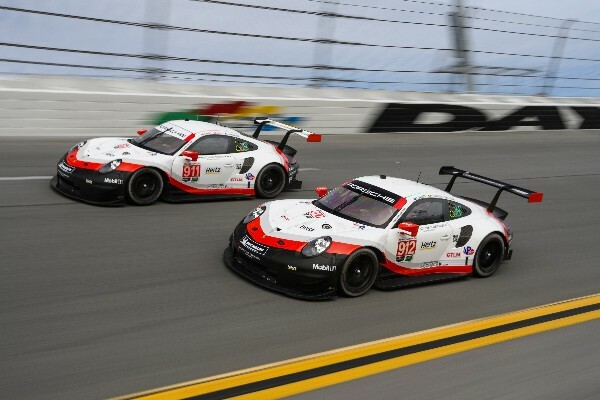 Both are past competitors in the all-manufacturer GTLM class with Tandy winning the 2015 Rolex 24 in the factory Porsche. Tandy revives his successful past partnership with Patrick Pilet (France) for the season, joined by Frédéric Makowiecki (France) for the endurance races. Bamber joins Laurens Vanthoor (Belgium) and Gianmaria Bruni (Italy) in the No. 912. Testing also concluded for the customer Porsche programs in IMSA’s Pro-Am category, GT Daytona (GTD). Three of the FIA GT3-specification 911 GT3 Rs were fielded by three teams with a focus on preparation as well as learning the new aerodynamic “evo kit” updates homologated for 2018 competition. Testing on the 3.56-mile track, which uses the famous NASCAR oval and the track’s infield road course, was the venue for the public debut of the newest GTD team, Wright Motorsports. While no strangers to Porsche or endurance racing, the 2017 Pirelli World Challenge GT Champions return to the series for the year with the No. 58 911 GT3 R with one of the strongest Porsche driver lineups outside of the factory GTLM team. North America’s only factory driver, Patrick Long (Manhattan Beach, California), leads the new effort with his full-season partner and Porsche Select Driver Christina Nielsen (Denmark). Porsche Young Professional Mathieu Jaminet (France) and 2016 Porsche Cup winner Robert Renauer (Germany) will co-drive in the race. The team deemed it a productive test. Manthey Racing will attempt the 24-hours for a second time in 2018 after its Daytona premier in 2017. Porsche factory driver Sven Müller (Germany) heads the group with Porsche Young Professional Matteo Cairoli (Germany), Steve Smith (Germany) and Harald Proczyk (Austria) alongside in the No. 59. Park Place Motorsports, 2017 GTD winners at Lime Rock Park, return for the endurance classic with Porsche factory driver Jörg Bergmeister (Germany) again sharing the car with driver/team principal Patrick Lindsey (Santa Barbara, California). The multi-year pairing adds veteran Porsche racer Timothy Pappas (Boston, Massachusetts) in the No. 73 GT3 R for the endurance rounds. Testing included five day sessions, one night session as well as a qualifying session which determined pit lane and garage locations for the 56th running of the 24 At Daytona. Patrick Long, Driver, No. 58 Wright Motorsports Porsche 911 GT3 R.
Cayman Test. Porsche Customers in CTSCC Enjoy Track Time in Daytona. The Continental Tire SportsCar Challenge (CTSCC) competitors enjoyed six on-track test sessions for the road-car based, GT4-specification machines. Four Porsche Cayman GT4 Clubsport MRs are on tap to be entered in the four-hour season-opening round of the series on January 26. Five tested at Daytona over the weekend. 2016 CTSCC champions Bodymotion Racing brought the No. 5 for Stevan McAleer (Monticello, New York) and Joe Robillard (Short Hills, New Jersey). 2017 Champions RS1 brought two of the mid-engine machines based on the Porsche Cayman GT4; the No. 18 RS1 driven by Spencer Pumpelly (Atlanta, Georgia) and the No. 28 piloted by the 2017 GS class driver champion Dillon Machavern (Burlington, Vermont). BGB Motorsports brought back the No. 38 shared by James Cox (Nokomis, Florida)/ John Tecce (Gladwyne, Pennsylvania).